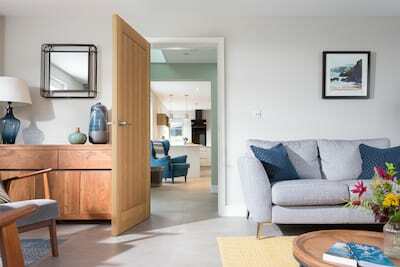 Located just a hop and skip from the beautiful North Cornish coastline, The Old Grain Store offers a warm welcome to friends and family looking to add a little luxury to holiday life. This charming cottage is packed with character and ensures a spacious layout for up to six guests to rest and unwind. Think farmhouse chic interiors, indulgent bedrooms, salvaged artefacts and a picture perfect cottage garden. 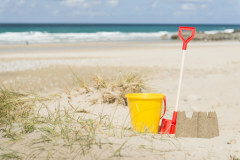 The golden sand beaches of Harlyn Bay, Porthcothnan, Mawgan Porth and Watergate Bay are moments from your holiday door or follow the coast road to Padstow, a quintessential harbour town. Arrive to a central hallway and lead into the farmhouse inspired fully fitted kitchen with Belfast sink, exposed beams and stylish Range cooker. Cook up a family feast using the finest Cornish ingredients from the local farm shop and dine at the large wooden scrub table over good conversation. The collection of three bedrooms are set over the ground floor, choose from the luxury of the king bedded rooms each individually styled and offering private access to the garden or the zip/lock bedded room with vintage 1940's walnut headboards. A central staircase leads to the first floor where the wonderful living space offers a light and tranquil area with far reaching rural views. Gather as a family and soak up the serenity, pop on a favourite film or step out for a sunset cocktail on the balcony. The Old Grain Store is as perfect for summer stays as for the cooler months beside the fire. 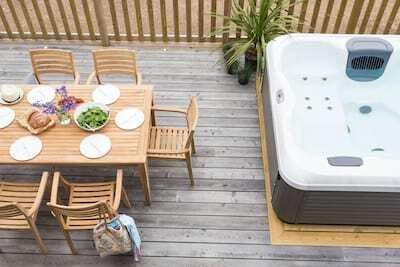 Wile away your holiday days in true Cornish style amidst the attractive garden with sea views offering relaxing spaces to dine and unwind. Dine al fresco at the bench style seating, dress the gazebo terrace to impress for celebrations of simply pull up a deckchair and ease away that busy home life timetable. The garden is enclosed for dogs to safely explore or enjoy the space and freedom of Pepper Meadow, a nearby meadow where guests are welcome to exercise their dogs. 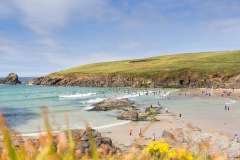 With the plethora of blue flag beaches just a mile or two away you are spoilt for choice, all dog friendly you can choose from the popular Watergate Bay to try your hand at kite-surfing perhaps or head to Mawgan Porth for a day in the waves. 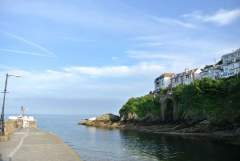 The coast path begins from your holiday door, follow the path through the valley and arrive at Park Head in approx 1 mile! 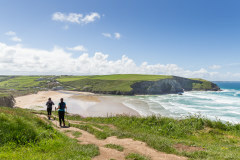 From Park Head, you can head step out North towards Porthcothan Beach or South towards the beauty of Bedruthan Steps. Stop for a cream tea at The National Trust Carnewas Cafe and follow the circular walk back home. Dining out is a must in this part of the world, those in the know will adore the creative culinary flair of Paul Ainsworth's No.6 (reservation suggested!) 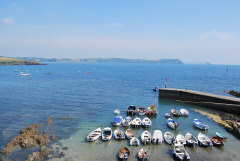 in nearby Padstow or simply indulge in Mr Steins luxury fish and chips quayside. Whatever the occasion, The Old Grain Store ensures the perfect base to engage in the coastal lifestyle of North Cornwall. For larger parties of 8, Karanithe can be rented for an extra two guests. Level access to the front door, one step up to the internal level. There is a slope within the garden area or via a step. The bedrooms are set on the ground floor. There is little-no mobile phone coverage in this location. 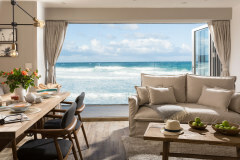 Please check with your carrier for further information.The property changeovers, welcome gift and maintenance are managed by the property owner. Wh had a most relaxing Christmas at The Old Grain Store it is the best we have stayed in so well equipped. 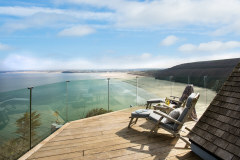 The Old Grain Store is a perfect location with easy access to Newquay and Padstow and lots of lovely beaches. The facilities provided by The Old Grain Store are a perfect environment for children. The Old grain Store is in a great location perfect for us all. We have had a lovely holiday here in Cornwall. Thank you. We had an amazing time in a perfect location. 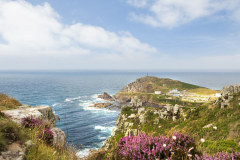 It really opened our eyes to how beautiful Cornwall is. 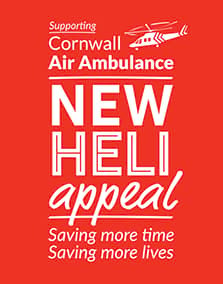 Thank you Cornish Gems. A gem of a cottage in a beautiful area. We enjoyed exploring many of the local beaches and bays with our four legged friend. A wonderful and relaxing stay. The cottage is well kitted out. We had a delightful time visiting all the beautiful beaches. A lovely cottage, comfortable and well equipped and some lovely walks. We hope to be back. The property we lovely, well renovated and very well considered. The beds were all super comfy, and the kitchen was very well equipped.